The first big race weekend of the year is about to get the green flag at Texas Motor Speedway. Hundreds of people have already parked their RVs and trailers and set up tents, just in time for potentially severe storms to roll through. TMS officials say about 1,000 campers have set up their belongings, with about 90 percent dropping everything off and set to return later in the week. Everyone who is staying knows that rough weather is headed their way. "We already knew; we came prepared," said Bobby Rosier, of Waxahachie. 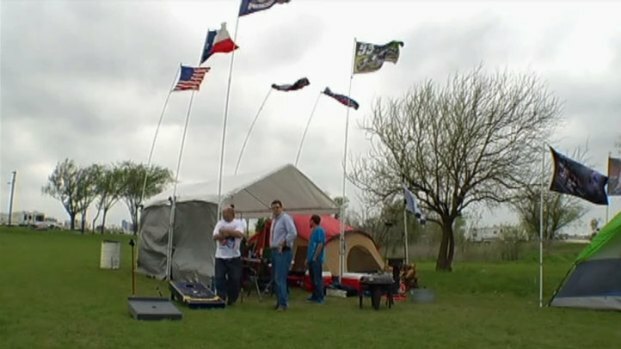 Race fans are already camping out at Texas Motor Speedway despite the possibility of bad weather. "We know the weather is coming. We know it's going to be pretty bad," said Chris Thomas, of Duncanville. Rosier and Thomas, who have season passes, have camped out at the speedway for years, and they've got a plan for Wednesday morning's storms. "Plan is to sleep in the car for tonight," Thomas said. "When everything passes over tomorrow in the morning, we'll get everything set up, and we'll be ready to roll." Race weekend and bad weather is nothing new for the dedicated NASCAR campers. "A lot of tents blow across here," said Hoby Smith, who is in his eighth year of camping at the racetrack. "We've fished a lot of tents out of the creek over there. We've lost one in the creek too." This time, Smith is confident that duct tape, zip ties and T-posts sunk a foot and a half into the ground will keep his family and tents safe from wins as high as 60 mph. He said he is also comfortable knowing he'll be informed if something really nasty heads their way. "We're not really worried," he said. "We got the weather (radio), the Wi-Fi. Track people come by every so often, keep us updated." 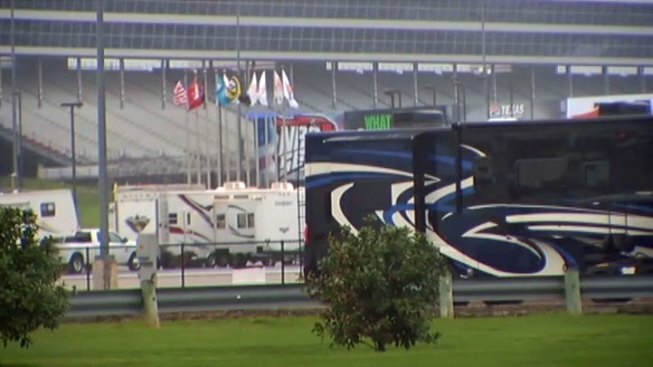 TMS officials say they watch the radar closely, not just for what might affect the track and its races, but also for the hundreds camping on grounds. The speedway says they will be watching and will send security out to warn campers if severe weather rolls into the area. Concourses will be opened, as will the tunnels used to drive toward pit lane. There are also structures throughout the campsites where bathrooms and showers are located. "We've got the tornado shelter right there at the bathroom," Smith said. And while everyone here is ready for the worst, they're more focused on the days after. "We make it through tonight, we're home free," Smith said. "We'll be ready to go, start partying -- that's what NASCAR does," Thomas said. As many as 15,000 people could be camping out at the race track by the time the Nationwide Series starts to race on Friday night. The NRA 500 is the premiere Sprint Cup event scheduled for Saturday night.